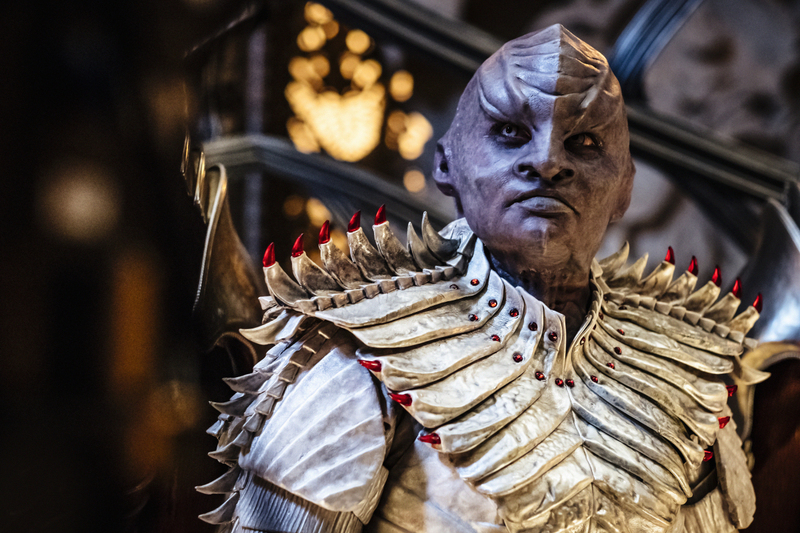 Ever since last week’s debut of Star Trek Discovery’s first two episodes, I’ve been reading a lot of online fan-rage about the new look of the Klingons. Many of them say the new Klingons look too “monstrous,” and far too different from previous interpretations seen in the Star Trek movies, Star Trek: The Next Generation and its various spinoffs, etc. Now, there’s some validity to that fan-rage; especially since DSC is supposed to take place 10 years before the adventures of Kirk and Spock in the original series (and 100 years before The Next Generation). Such a radical new look would be hard to explain away in 10 years time. Personally, I’m not bothered by it, but I’d like to address it anyway. The Klingons seen in DSC belong to a fundamentalist dissident sect (set analogies to ‘stun’) who seek to unite the 24 Houses of the Klingon Empire by instigating a war with the Federation. What a lot of these upset fans seem to forget (or are perhaps too young to recall?) is that the Klingons have been continuously reinvented for every age in which they’ve been presented. 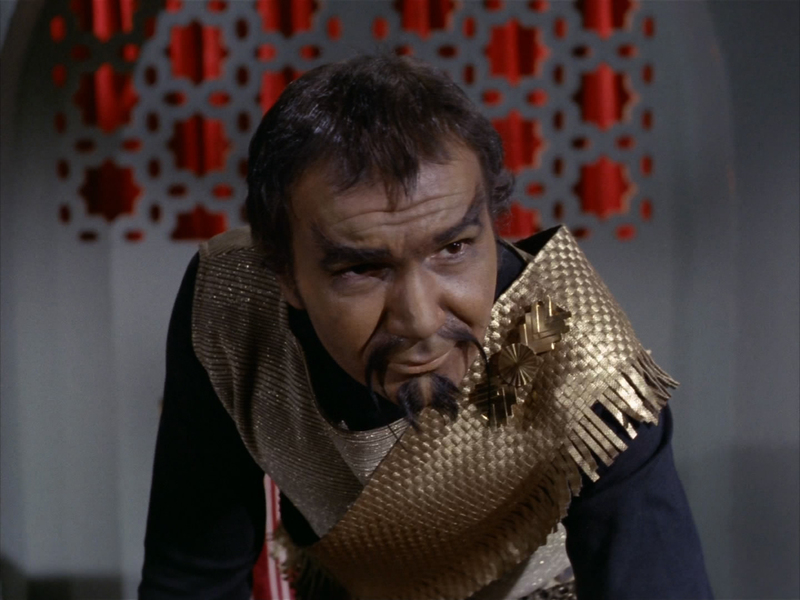 ^ John Colicos is the original Klingon “Kor” in “Errand of Mercy” (1967). In the 1960s, they were used as avatars for the Soviets and Red Chinese and given the makeup/budgetary limitations of the time, they were just regular guys in swarthy makeup with van dykes or goatees. ^ Kirk gets an all-too easy confession out of a ‘60s model Klingon soldier (played by “Robinson Crusoe on Mars” costar Vic Lundin). They were portrayed primarily as lying, sneaky, untrustworthy saboteurs and cheats. They poisoned grain shipments (“Trouble With Tribbles”), they killed hundreds of unarmed hostages (“Errand of Mercy”), they sabotaged warp drives (The Animated Series’ “Time Trap”) and turned on their allies (“Friday’s Child”). ^ Michael Ansara plays a Klingon (“Kang”) in 1968’s “Day of the Dove” who is one step closer to the noble warriors seen in later Star Trek. Those were the Klingons from 1966-1974 (the end of the Animated Series…and yes, dammit, I count the Animated Series). Those Klingons were the worst Western fears and prejudices about ‘the Red Menace’ personified. Cut to December of 1979 with the release of Star Trek: The Motion Picture. But most surprisingly, their heads were now marked by receding hairlines with large, crustacean-like spinal cords arching over their scalps and onto their nose bridges. They also had sharpened teeth. 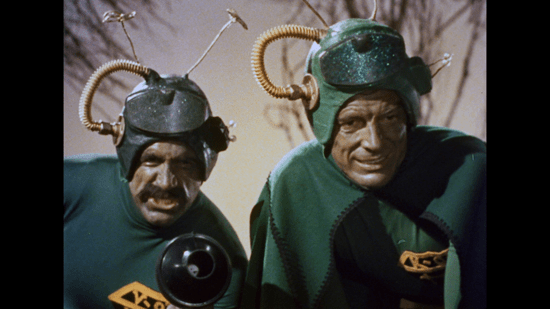 They looked much more alien than the Fu Manchu wannabes of the 1960s. We didn’t learn much (or anything) about their culture in The Motion Picture, but it was clear from their unprovoked attack on the V’ger cloud that their hostile nature was certainly intact. The movie’s sequels, “The Search For Spock” (1984) “The Voyage Home” (1986) “The Final Frontier” (1989) and “The Undiscovered Country” (1991), all followed this look but with more variations. The ‘lobster scalps’ were much more individualistic; and the Klingon culture was redefined in something of a ‘noble savage’ mold; with a strict honor code not too unlike Feudal Japan. “The Undiscovered Country” carried the old Russian analogy of the ‘60s to its logical end; with the Klingons suffering a Chernobyl-style catastrophe which brings them to the negotiating table. There was even a “Gorbachev”-like leader, played by David Warner (“Time Bandits” “Star Trek V” “TRON” “Time After Time”). This was how the Klingons would be seen now, in the age of post-glasnost/perestroika. It’s also a natural segue to the Klingon Starfleet officer “Lt. 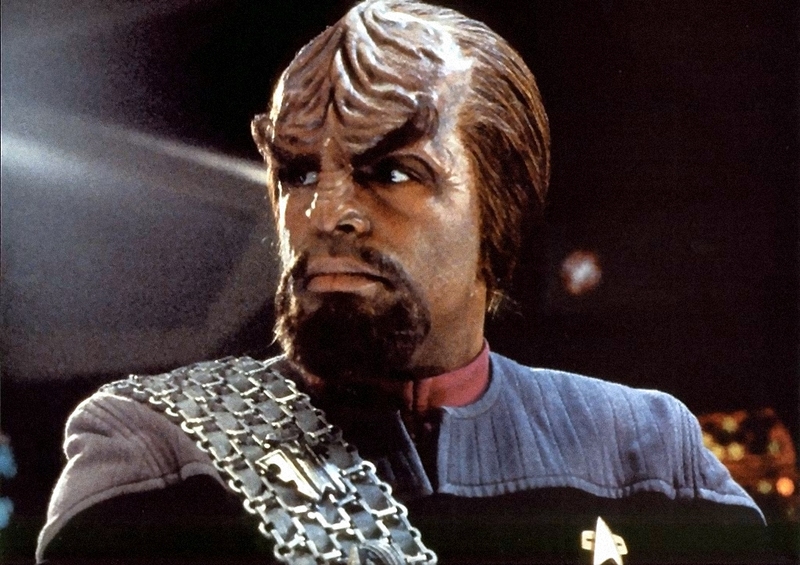 Worf” (Michael Dorn), whom we saw debut four years earlier in Star Trek: The Next Generation. 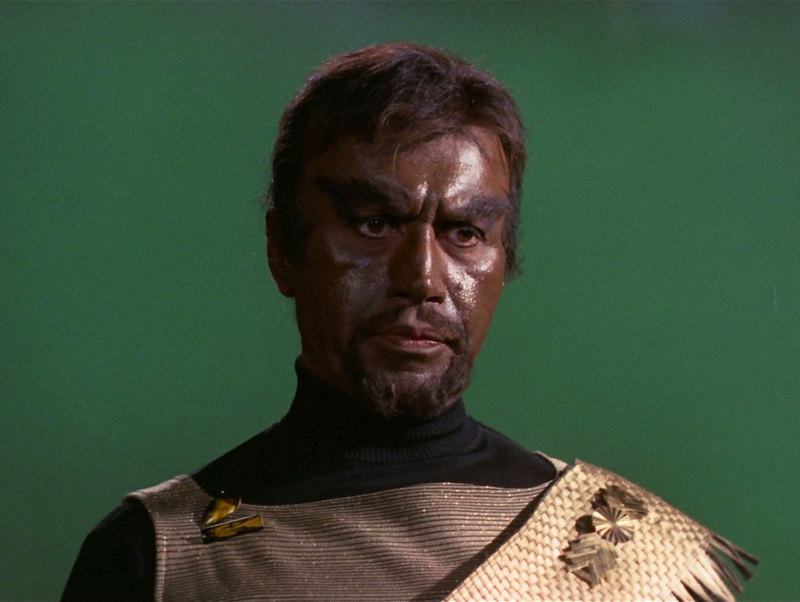 The honorable, noble warrior visage (first hinted at in Search for Spock with Christopher Lloyd’s “Kruge” and his line, “Your name will be remembered with honor!”) was further refined in Star Trek’s own ‘future’ of the 24th century. Klingons, like the Russians of the 1990s, were now in an uneasy peace with the Federation (America/NATO). The noble warriors of TNG were more or less how Klingons remained throughout 18 solid years of televised Star Trek, from The Next Generation (1987-1994), Deep Space Nine (1993-1999), Voyager (1995-2001), and the prequel series Enterprise (2001-2005). The Klingon Starfleet officer Worf would prove popular enough to beam over to the final four seasons of Deep Space Nine, as well as four Next Gen movies. 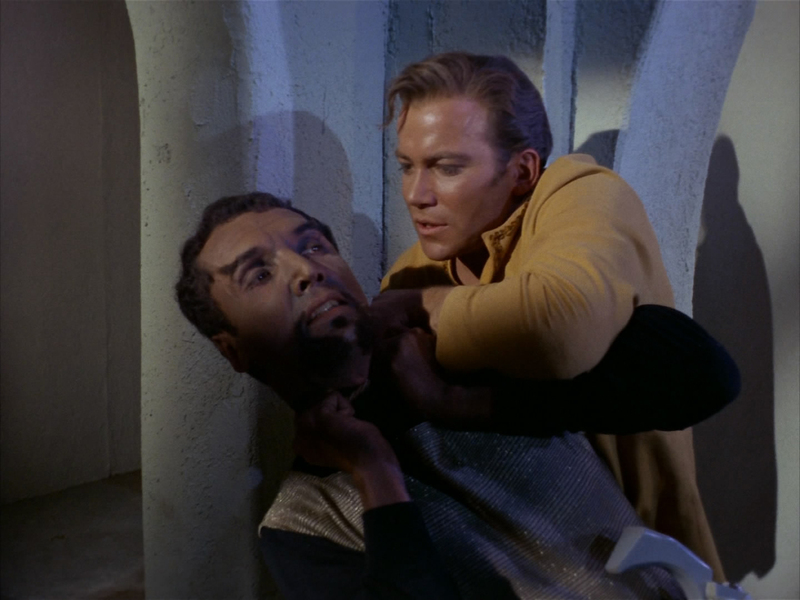 Interestingly, Deep Space Nine’s second season would feature a reunion of three Klingons from the original series; “Kor” (John Colicos), “Koloth” (William Campbell) and “Kang” (Michael Ansara) who reunite in a “Blood Oath” to kill an ‘albino’ who murdered Kang’s son decades earlier. ^ Kor, Kang and Koloth, reunited in Deep Space Nine’s “Blood Oath” (1994). 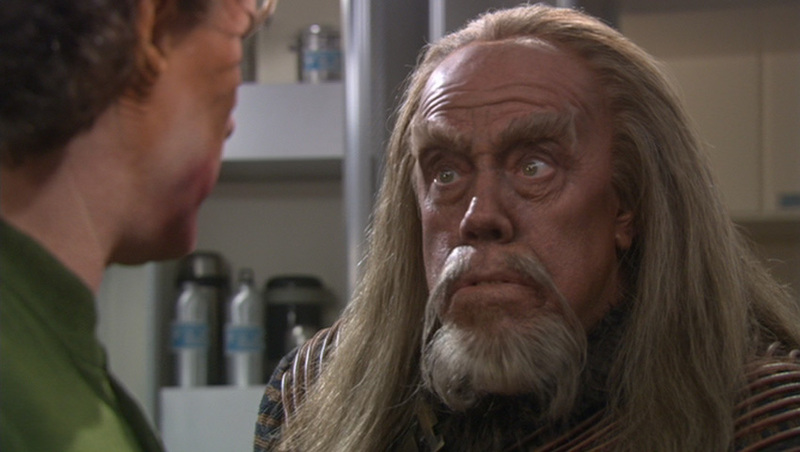 The three actors all appeared in modern Klingon makeups; complete with bumpy foreheads and elaborate wigs…. and no one cared. No one asked why they looked different. It was just accepted for story’s sake. Period. Kor would later return to future episodes of DS9 as well, and would team up with Lt. Commander Worf. The spinoff series Enterprise even had a two-part episode (“Affliction”/“Divergence”) which finally answered the 26 year old fanboy question of just how the Klingons of the prequel series transitioned from the lumpy-foreheaded variety to the smooth-headed, swarthy saboteurs of the ’60s. 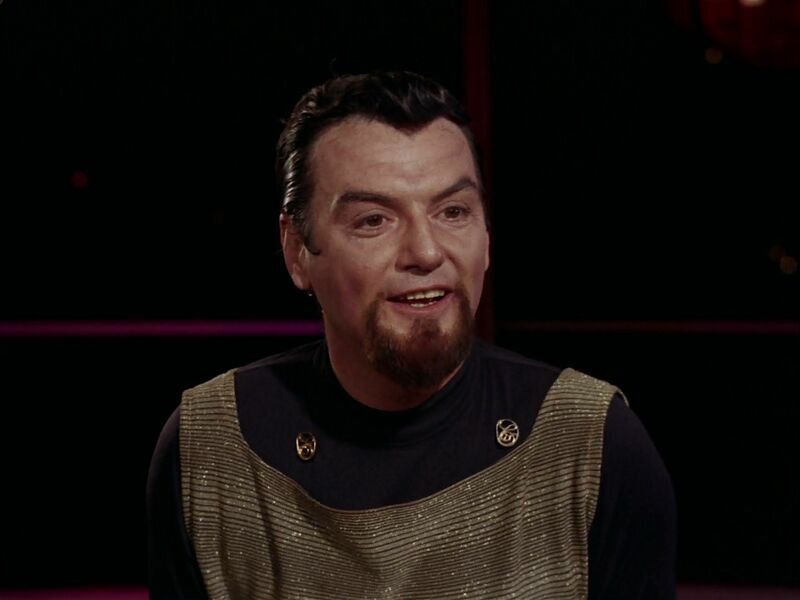 Actor John Schuck, who played a Klingon ambassador in two ST movies (“The Voyage Home” & “The Undiscovered Country”) would play a Klingon physician in the two-parter. 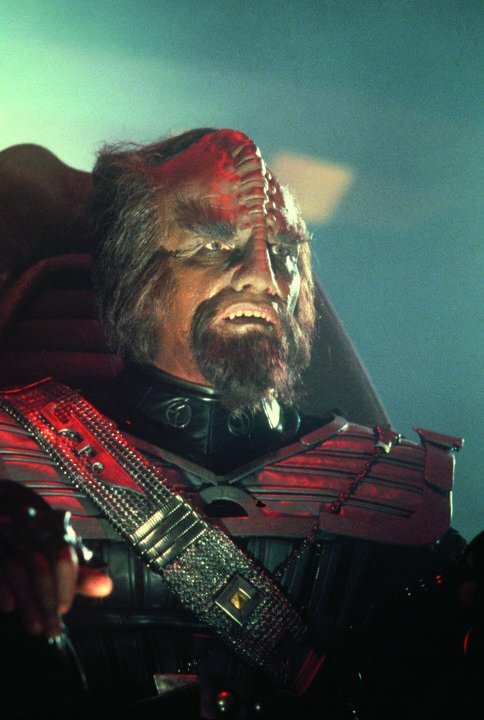 Turns out the Klingons were carelessly tampering with ‘augmented’ superhuman DNA; the same sort of DNA used in the creation of villainous 1990s Eugenics’ Warriors such as the infamous “Khan” (of “Space Seed”, “The Wrath of Khan” and “Into Darkness”). They were attempting to improve their warrior stock with the augments’ super-strength, they failed, and instead created a lethal virus that was eventually rendered non-lethal, but left generations of Klingons with accursed ‘human’ foreheads. ^ It was the DNA of genetically augmented humans like Ricardo Montalban’s Khan that led to the smooth-headed Klingons of ‘60s Star Trek… hmm, who knew? “Star Trek Into Darkness” (2013), one of my least favorite of all of the Star Trek movies, featured yet another subtle redesign of the Klingons. These new Klingons were only featured in one scene, and were bald headed, had bright contact lenses, and (most interestingly) jewelry piercings along their scalps. The internet, of course, dubbed them “Blingons.” The movie itself was a bit of a hot mess (more on that another time), but the Klingons in it were an element that I found compelling. Cut to the debut of the new TV/streaming series “Discovery”, which debuted only last weekend. The opening scene features all-new Klingons. Klingons who wear radically different costumes (beautifully ornate golden, metallic-fabric ceremonial costumes that even the movie budgets and crews couldn’t have afforded/created in 1979). Their makeups are radically different as well. They are closer in overall look to the “Blingons” of Into Darkness, but even less familiar. Their culture is now defined as a culture torn in civil war and strife, seeking unification under a fundamentalist leader named “K’Tuvma” (Chris Obi). 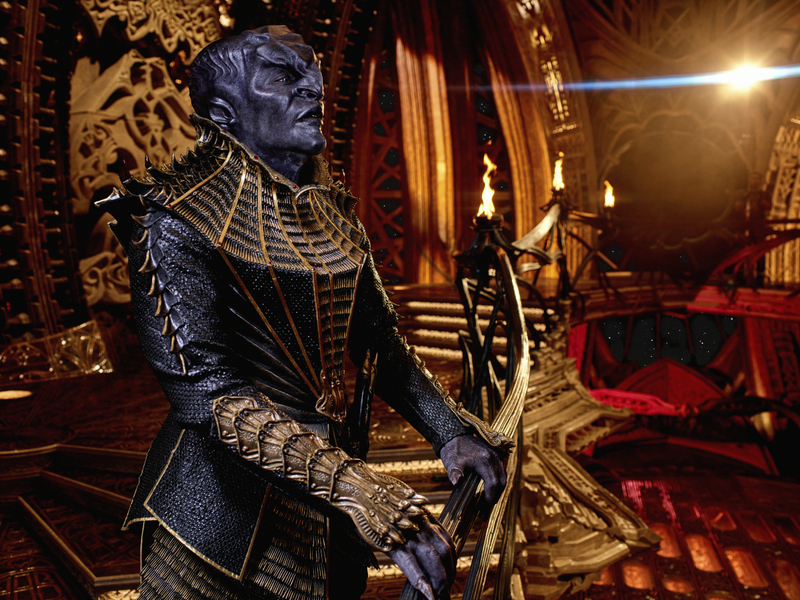 The new Klingons are once again the malleable antagonists who fit the age they’re in. Now they’re representing a more global issue; the danger of both fundamentalism (be it Islamic, far-right Christian or other) and people blindly rallying behind personality cults at the expense of their wisdom and common sense (Osama bin Laden, Donald Trump or even Bernie Sanders). 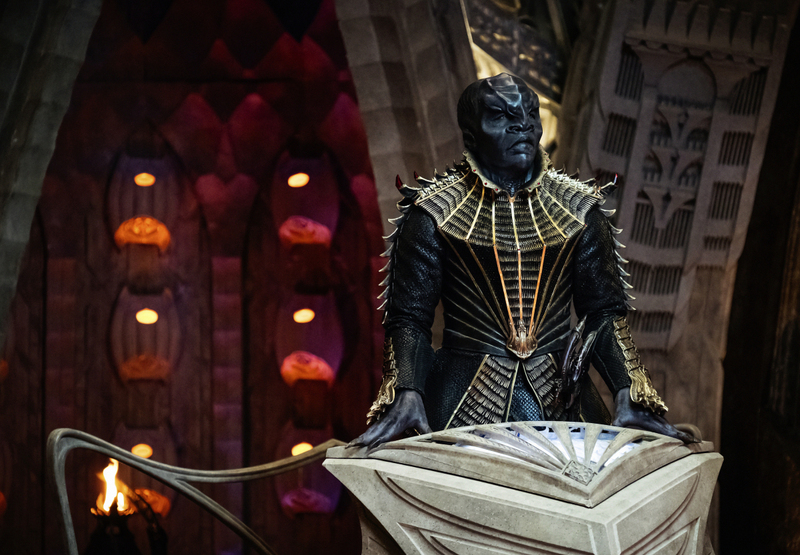 The lesson gleaned from Discovery’s Klingons is that submitting blindly to authoritarian figures who promise the stars seems far easier than solving problems through patience, perseverance and hard work. And in these times, that is the real ‘villain’; forsaking wisdom and logic for charismatic charlatans who claim to have all the answers, as K’Tuvma promises his fundamentalist followers. In another interesting scene, K’Tuvma even takes in an outcast “albino” Klingon (possibly the same ‘albino’ seen in Deep Space Nine’s “Blood Oath”?) who is ostracized from mainstream Klingon culture but taken into the cult for his loyalty. I was intrigued; this was a very sly analogy for both racism and radicalization. How one affects the other. Radicalization takes disaffected ‘outsiders’ and pumps them up with artificial confidence, stirs, and voila…it creates instant followers. Radicalization is that common thread seen in both jihadists and white supremacists. Taking take angry young people, and arming them with a cause seemingly greater than themselves. I found it very appropriate that these new Klingons were addressing that common denominator in all extremist groups. So despite the internet fan-rage, I think these new Klingons have the potential to be much more relevant to our current time than the ‘space Vikings’ previously seen in 18 years of televised Star Trek. And I say ‘potential’ only because Discovery is still very much in its infancy. It’s two episodes in, and we haven’t even seen the titular starship yet (!). So the ever-elastic villains, who began as sneaky, dishonorable saboteurs (stand-ins for the Russians and the Red Chinese) now represent those most dangerous aspects of ALL cultures, not just the United States’ current enemies of the moment. ^ Mary Chieffo plays a fundamentalist Klingon warrior named “L’Ress”; I met Chieffo in Las Vegas a couple of months ago, and she was a sweet young lady…nothing at all like her battle-hardened Klingon character. Now, do I care that the Klingons suddenly appear fully bald, bluish-gray and once again look different from their Next Gen counterparts? No, not really. To be honest, my 13 year old self didn’t care when I first saw their new look in The Motion Picture either. Will I care if their new appearance is explained or not? Well put it this way; if they can explain it? Sure. If they can’t? Then I really don’t care. At the end of the day it’s cosmetics. An aesthetic choice by the new production team, and nothing more. I was also intrigued that these Klingons seemed to share the same history as the more ‘traditional’ Klingons seen in the other ST series; we hear mention of the Donatu V battle (mentioned in “Trouble With Tribbles”), hear the Klingon death howl (Next Gen’s “Heart of Glory”) and see Klingon mummification and sarcophagi (mentioned in “Star Trek IV: The Voyage Home”). 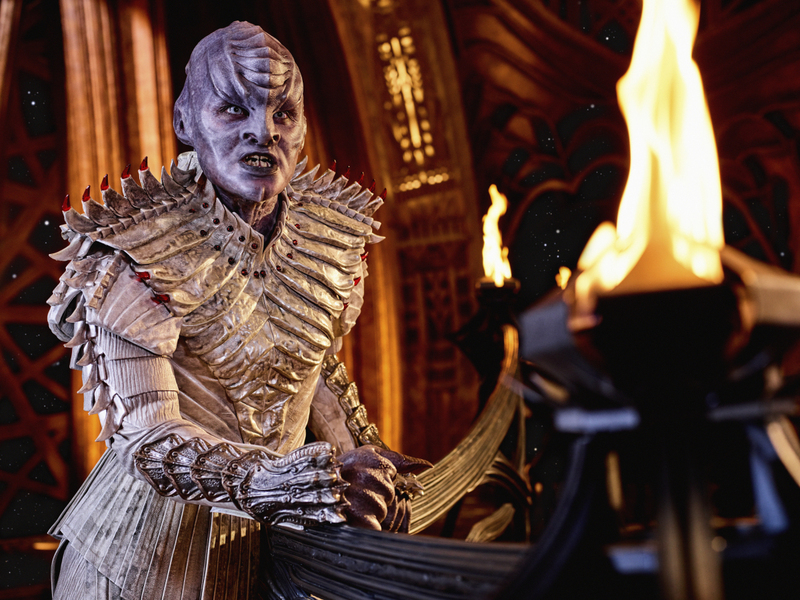 So these new Klingons aren’t wholly dismissive of their roots and origins in Star Trek lore…they just got a bit of a makeover, that’s all. Just as they did in 1979. What’s more important is whether or not these new Klingons, as villains or as allies, have something to say. Otherwise, they’re just target practice for the good guys, and that to me is no more interesting than hordes of zombies in a video game. From what I’ve gathered the Klingons will be important in this new series, and they will have something to say. That’s far more important to me than whether or not they have bluish skin or bumpy foreheads. Aw thanks, Corylea! Made my day.